The first Outlast had its scary moments, but if this Gamespot exclusive gameplay video from the sequel is anything to go by, tension is being ramped up in a big way for Outlast 2. Suddenly our list of the best zombie games seems tame. 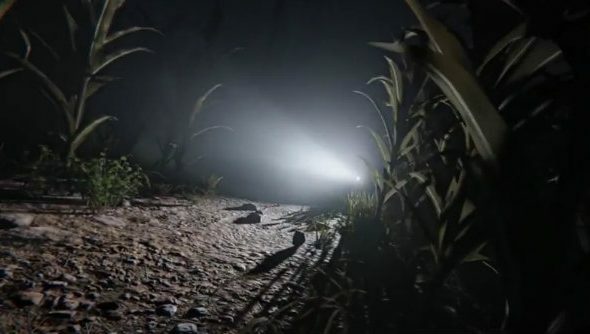 The first thing you’ll notice from the Outlast 2 gameplay reveal is that it looks lovely. Well, it looks horrible, but it’s much more polished than the first game. The second thing is that stealth has been expanded, as you can go prone here, which is likely an addition to make the seemingly larger outside areas more fluid when attempting to escape from a flashlight-wielding mob. There’s still that same brilliant sense of presence – present in the original game – with the character’s hands and feet anchoring you in the world, along with the night vision camcorder. At one point, the protagonist dives into an animal feeding tray and submerges themselves to hide from the searching enemies. Upon exiting, droplets of water cling to the camera lens.